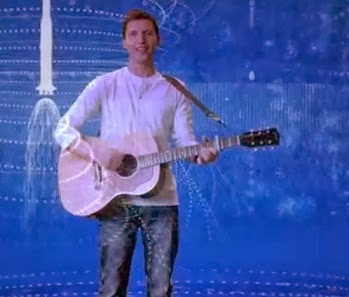 James Blunt came crashing in with his second single lifted from his Moon Landing album. My personal not so favorite song entitled Blue on Blue has made its way into the tube with a new music video still incorporating the "astronomical" theme of the album with the help of projectile lights resembling outer space phenomena and spaceships... It is much replicating the effects of the Northern Lights. But no matter how bright and glittery the music video is, just like the song, it fell short to my liking. It is like a sub par video making: rushed and released half-way though production. Who did they fool that by adding super complicated lighting effects would already make the video great? Watch the new music video of Blue on Blue by James Blunt. If you are just like me, the new music video of Blue on Blue just added to my mild dislike to the song. All in all, the music video doesn't really help and made it worse... Can we have another video the kind of which we've seen in Bonfire Heart? I'm sorry James Blunt, but I am expecting so much from you after seen your best in the past.